The Great Gatsby is a terrific example of how a bunch of money-obsessed, vacuous, overall completely unsympathetic characters can still combine into an atmospheric, humorous, layered and meaningful piece of writing. Without the always present, borderline puerile ironic undertone this may well have been absolutely terrible. Minor spoilers follow. Somehow I’d never read The Great Gatsby . Unfortunately it’s constantly and surprisingly ubiquitously referenced, and a few days ago an almost undoubtedly wrong, random Internet comment served as the straw that broke the camel’s back. It was claimed that in Gatsby’s library you could see he didn’t read his books because his bindings were intact. All that tells you is that a person is not an animal. What must’ve evidently been meant is that the pages were uncut, still held together in their signatures. To see an uncut book is a rarity these days, though I find that in my own century-old books often the first few pages remain uncut. In any event, my suspicions were quickly confirmed. Gatsby hadn’t cut his pages, but not a peep about the bindings. 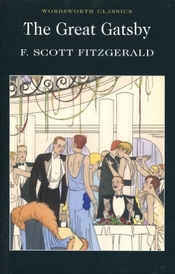 F. Scott Fitzgerald, Guy Reynolds (foreword) (2001). The Great Gatsby .